Sub-freezing temperatures across swathes of Europe have claimed almost 60 victims in recent days—notably in Poland, Romania and the Balkans—with migrants and the homeless among the most vulnerable, officials said on Tuesday. 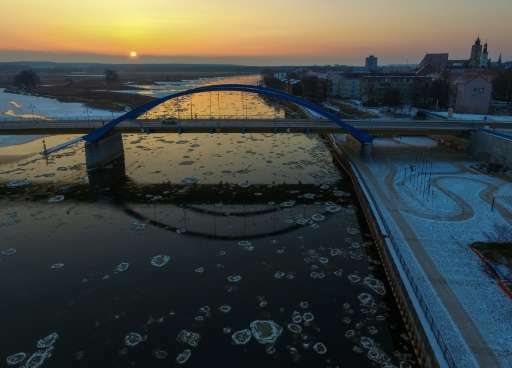 Six people died in Poland and seven more in the Balkans over a 24-hour period as temperatures plunged across Europe, while Romania announced six deaths in recent days. 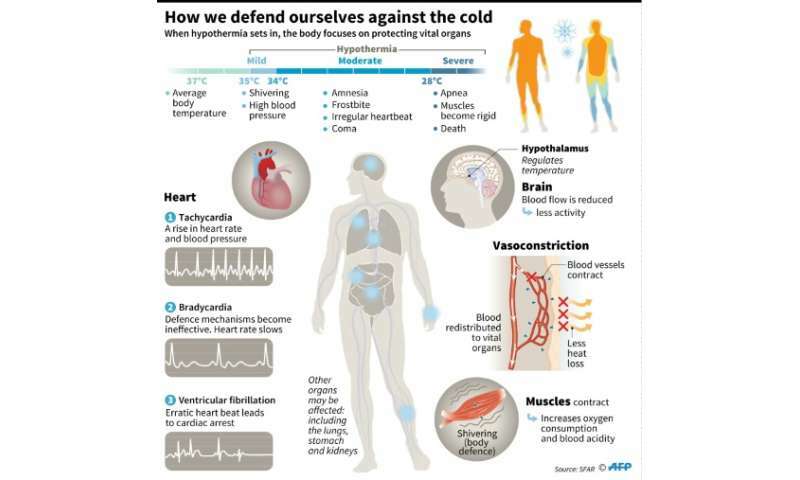 Authorities in Warsaw said the toll of hypothermia deaths in the country since November 1 had now risen to 71. Polish police urged people to help those most vulnerable, especially the homeless, as the mercury sank to below minus 20 degrees Celsius (minus 4 Fahrenheit) in some regions. "Another six people died due to exposure over the last 24 hours," the centre for national security (RCB) said on Tuesday in a statement. Local authorities have also issued smog alerts across Poland, urging children and the elderly to remain indoors as coal and waste-fired home furnaces drive up air pollution to the highest levels recorded in years. Last winter in Poland was unusually mild but still claimed 77 lives in the nation of 38 million, compared to 78 in 2013-2014 and 177 in 2012-2013. In the Balkans, a father and son were amongst at least seven people reported to have died in the last 24 hours, local media said—three each in Serbia and Macedonia, and one in Albania. In the south of Serbia, where temperatures have fallen below minus 20 Celsius and a state of emergency has been declared, an 88-year-old father and his 64-year-old son died of the cold in the village of Duga Poljana. But in the east of the country there was rare good news as national television station RTS reported the miraculous survival of a man in the village of Smoljinac who survived for two days in temperatures reaching minus 20 Celsius after falling down a well. Finally rescued by a neighbour, he was taken to hospital. The current deep freeze sweeping Europe has also killed six people in Romania in recent days, according to first official figures released by the health ministry there. This raises the total number of deaths across the continent to almost 60 in recent days, with many of the victims being migrants or homeless people. In Greece, which has more than 60,000 mainly Syrian refugees on its territory, many migrants have been moved to prefabricated houses and heated tents. It has also sent a landing craft to Lesbos to pick up refugees and migrants currently living in miserable conditions in the Moria refugee camp, navy spokesman Spyridon Pollatos told AFP. The craft "should arrive on Wednesday and can house 500 people", Pollatos said. More than 2,500 people, "including children, women and disabled people" are living "in tents, without either hot water or heating" at the Moria camp, said Apostolos Veizis of Doctors Without Borders. 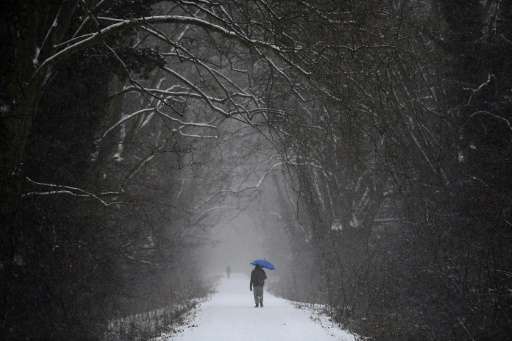 Since Friday, Greece has been hit by an unusually cold snap and heavy snowfall. Meanwhile, traffic on the Danube between Romania and Bulgaria was halted indefinitely on Tuesday as temperatures plunged to below 30 degrees Celsius. Schools remained closed in large parts of Romania, with more snow storms forecast for Tuesday evening. 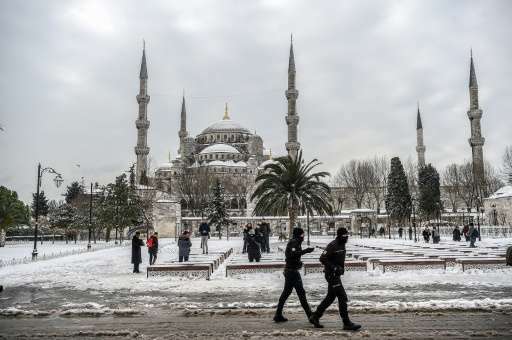 Heavy snowstorms also reached Turkey over the weekend, paralysing its biggest city Istanbul where almost 65 centimetres (25 inches) of snow fell, forcing hundreds of flights to be cancelled on Saturday. Two people died of hypothermia in Moscow between December 31 and January 9, Russian news agencies reported on Monday.